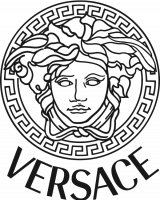 Gianni Versace S.p.A. is an Italian fashion clothing business founded by Gianni Versace in 1978. After the death of Gianni Versace, his sister, Donatella Versace, took over his business and continued usage of the family's trademark of using bright colors and designs. She was born in Reggio Calabria Italy, in 1959, being 13 years younger than Gianni. Brother and sister had a very close relationship and Gianni considered her his muse. He was one of the most important Italian designers of the 1980's and 90's, famous for his strong colour sense and clean lines. He like to wrap the female form, often with bias-cut clothes and fluid silks. Many of his ideas were audacious, but all were carried out to a high level of technical achievement. 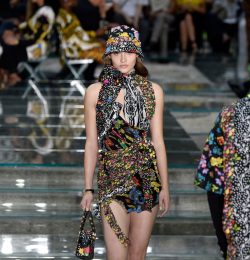 Versace viewed his clothes as powerful statement which were executed with unfailing confidence. Almost always the body was swathed or the garment wrapped in some manner. In his clothes, classical historical references blend with bold geometric shapes and complex textures in brilliant colours. His designs are unmistakable, he enjoyed working with leather and experimenting with new fabrics and trimmings. 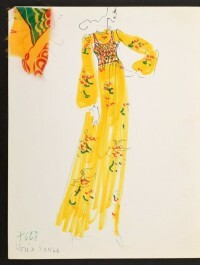 His designs for the theatre and ballet, undoubtedly influenced his fashion work.